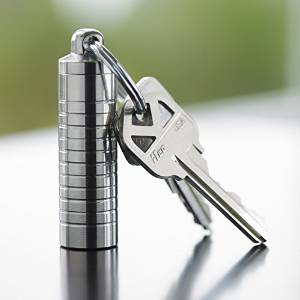 What do you think of this Keychain Pill Holder? Cielo Pill Holders are thoughtfully designed to make you feel better, just like the medicines they contain. Sure you can use plastic, throw-away versions of this everyday item, but do you really want to? Just like nice sunglasses or a good wallet, Cielo Pill Holders transform an ordinary item into something that makes you feel good every time you use it. Cielo Pill Holders are virtually indestructible - they're made of medical grade stainless steel with a design so tough, you can run it over with a car and it won't break.